¡Hola! Full Stack Fest! It’s a pleasure to be here. I’ve heard such great things about this conference. So it’s a privilege to be here. Thank you to the organisers for inviting me. You can catch me on Twitter here, but please ask question at the end and find me in the break. I’d love to hear about your performance wins and struggles. I’m a software engineer at the Edge Cloud provider Fastly. So why am I here to talk to you today? You’re probably wondering what the title “To push, or not to push” even means? If like me, you’ve probably heard a lot of people say something along the lines of “HTTP/2 will solve this” Myself included. Resource loading in the browser is hard. However, sadly it’s not as simple as that. Resource loading in the browser is hard. Hopefully after this talk you’ll have a better understanding of why and what techniques we can use today and in the future to solve this. How can we load our resources most efficiently? So how can we load our resources most efficiently today? What best practice patterns and techniques should I be using to load my resources? First we must determine what our critical resources are that we need to prioritise. Lets do a thought exercise with this page. What do we think are the critical resources required for a fast user experience? When we talk about resource loading, we commonly discuss the critical path and critical requests. Ben Schwarz of Calibre describes the critical request as: A critical request is one that contains an asset that is essential to the content within the users viewport. What are my critical resources? Once you’ve identified the requests, determine whether they contribute to the user experience of your initial load. Is it critical content? Is it needed for interactivity? It’s this portion of the page lifetime that we’re going to focus on today. How we can help the browser discover all of our critical resources up front and ensure we send the data for them as soon as possible. Now we’ve identified what we should be loading, lets dive into how we can do this efficiently. The first technique we’ll look at is the Preload API. What if we could tell the browser ahead of time what are critical resources are? We identified that fonts are critical resources. However they’re requested late in load. Why is this? Browser requests the HTML document Begins parsing and constructing DOM Discovers CSS/JS Waits for CSS response constructs CSSOM Combines CSSOM and DOM intro render tree Font requests are dispatched after the render tree indicates which font variants are needed to render the specified text on the page. What are my hidden sub-resources? This is where the preload api comes in. It: Provides a declarative fetch primitive that initiates an early fetch and separates fetching from resource execution. I.e. it allows the browser to perform the networking without yet discovering the resource during parsing. How can I use Prelaod? So this is what it looks like, we now have three new primitives in HTML, JS and HTTP. My preferred method is via the HTTP Link header. Preload JSON as fetch! Modulepreload! Lets’s look at the network waterfall for FT.com Note how low down the font requests are, even though they’re critical resources? By applying preload headers we’re able to prioritise and initiate the fetches early for the fonts. Note the change in order of network priority for our resources. Fastly customer Shopify switches to preloading fonts and saw a 50% improvement to time-to-textpaint. 1.2 seconds improvement of a 3G connection. I’ve been in the perf industry a long time and have never seen a single technique give the ability to do this. Are indicating resource hints via the HTML response too late? We’ve seen how preload is a very powerful and simple tool to indicate critical resource hints. However is indicating resources via the HTML response like this actually too late in the connection lifecycle? This is what HTTP/2 server push WAS designed to solve. Let’s take a look at how it can help us. What if the server could predict that the next resource the client will request is the main.css file and push/flush the bytes down the connection whilst the server is constructing the HTML response. HTTP/2 calls this a push promise, a data frame that signals to the client we will send you the bytes for this file so no need to request it. How is this possible? All communication within HTTP/2 is now performed via a single TCP connection with a binary data framing layer. This allows us to send data for multiple requests at the same time, and even data not part of the response, such as a push promise. So how can I push? So the question is should we be using server push at all? Is using Link rel=preload as the push indicator in-fact too late in the connection state? So how can you programmatically indicate a resource to be pushed. The most common mechanism the industry has converged on is via the Link header and our preload friend. You must have a HTTP/2 enabled server with push support. Not that we don’t have the no push directive. So lets look at a typical network waterfall before using h2 server push. Note we no longer have idle time on the CSS response as we wait for the content, as the browser never had to send the request. Comparing before and after, we’ve effectively reduced our page load by 1 round trip. Average ~800ms on a 3G connection. This is great if our RTT time has high latency, I.e. on mobile connections in developing countries. Why is this? Let’s look at the request flow again. As server push is indicated via a Link header on the response of our document we have to wait for the server to generate the response before we can push. This leaves a lot of wasted time on the connection, especially if we are using a CDN or proxy service. THIS MAKES ME SAD! Is indicating push via the HTML response too late? Is indicating push via the HTML response using link rel=preload in-fact too late in the connection state? As we have to wait for HTML before we can push. So the question is should we be using server push at all? How can we achieve the holy grail and push our critical resources during this period. Do do this we need to decouple the push behaviour from the HTML response. This is what at Fastly we’re calling async push. A more common architecture will be for the HTTP server to be decoupled from the application server. Think a reverse proxy etc? nginx/apache/varnish This allows us to decouple the push logic from the application and initiate a push of the resource as soon as receive a request for the HTML even before we despatch the request to the application server. Achieving our holy grail of pushing during idle think time on the connection. If we have programatic access to the open network connection within our application server we can flush the CSS push before we generate the HTML. Here is an example using Node’s http/2 server to flush the push at the beginning of a request middleware. Note the first thing we do in the response handler is to push the CSS. What about the repeat view? Whilst push is useful on the first view, what do you think would happen on a repeat view? The client already has the asset cached. We have no way of indicating to the server what is in our cache! So lets look at the network utilisation from our push experiment. If we were to request the same page again what happens? Note we’ve over-pushed the resource, and could potentially create contention on the network or delay our HTML response. Worse than not pushing at all. One solution to this is to use the PRPL pattern. Push minimal code for initial route Lazy load the rest and cache in ServiceWorker Subsequent requests come from SW so no never hit server to initialise push. Addy and Eva’s talk from Google I/O this year. The server has no knowledge of client cache state. The client already has the asset cached. We have no way of indicating to the server what is in our cache! So if the theory is right, this should be an extremely useful technique for resource loading? But the adoption is extremely low. So whats the problem? After we have sent the push promise frame to the browser it’s common that we’d start flushing the data frames. If the browser already has the resource in it’s cache, it can send a RST_STREAM message to cancel the data. However this is normally too late, by the time the reset reaches the server most of the bytes for the resource have already been flushed to the physical network link, or are in the kernel TCP buffer. New QUIC protocol can solve this moving more work to user space instead of the kernel. If not claimed end up being slower than if you hadn’t pushed at all. 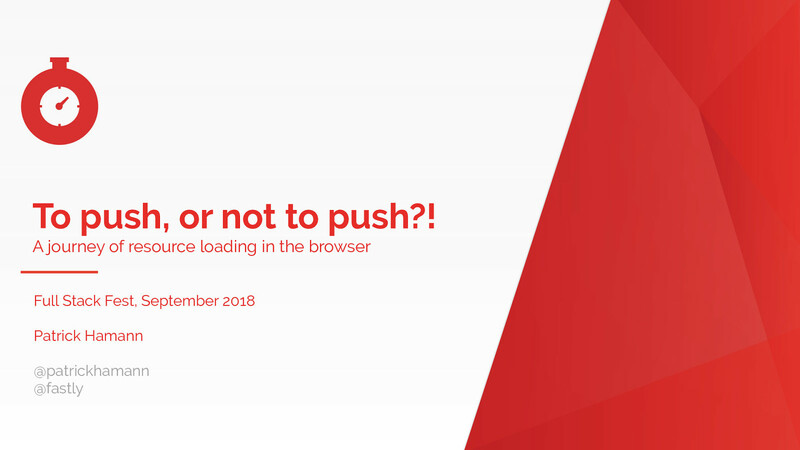 Jake Archibald has done extensive research into the browser inconsistencies of push. I urge you to read this blog post if you’re considering using push. The TL;DR the browser inconsistencies of the push cache results in only chrome and Firefox having reliable implementations. - Edge one connection per tab, no fetch - Safari non-deterministic Thus leaving us to resort to UA sniffing if we want to use without any gotchas. Lastly the rate of adoption of push is extremely low. On Fastly we observe 800 out of 1000000 responses on our network are push initiated. 6 million requests a second. The rate of adoption is even leading to many implementers to abandon the pattern. Google and Akamai presented research at the last IETF meeting. Chrome noticed no difference in mobile performance if they disabled push. Akamai noticed some, but most tests produced no statistical significance. So is the 1RTT saving worth the complexity? So if push might not be worth it? What are our other options? Each of the techniques I’ve presented so far, have had trade-offs. However, I’m really excited by the what the near future holds for us with regards to resource loading in the browser. Can we fix the problems with push? So can we just fix the problems with push? This is where cache digests may be able to help. Now the server has enough information to decide whether it should push the resource. I’m also excited by the other possibilities this gives us to create intelligent applications on the server. With cache digests this fixes the repeat view issue. The specification is still being actively worked on in draft. However implementations are starting to appear. Kazuho and Yoav Weiss Fastly’s open-source H20 HTTP/2 server was the first to have a working implementation. But this still seems too complicated. We are maintaining a lot of logic and state on the server. This is where the 103 Early hints status code comes in. Proposed by my colleague Kazuho. 103 is a new HTTP response code that allows the server to indicate to the client resources that it is likely to send in the final response. This allows the client to initiate early fetches for the critical resources before it has even received the HTML. Much like the benefits of async push but with the simplicity of allowing the client to decide what it needs to fetch. Just like header flushing. This is what a 103 HTTP response would look like on the wire, with its proceeding 200 response of the HTML. The spec has been accepted by the IETF as RFC 8297 and is currently in experimental. Fastly already has working server implementation. Browser vendors are very interested, but some are concerned about the complexity of implementation. With early hints we get the same benefits of async push, but much simpler. Giving the power back to the browser to make the decisions on what it wants to fetch and appropriately leveraging the browser cache. Now we know how to decorate the HTTP responses with resource hints, using preload and early hints. What if we could also decorate our HTML and sub-resources to change resource priorities. This is where the priority hints api comes in. An extension to preload, priority hints aim to give the author granular control over the priority of each resource loaded by your page. You as the application author know best the priority of your resources. Check out Addy and Eva’s talk from Google I/O this year. Priority Hints draft - https://github.com/WICG/priority-hints If you’re interested, going the discussion on GitHub. Performance is for humans. Optimise for user experiences. Performance is for humans. Always try to optimise for delightful user experiences and not the network. View To push, or not to push?! on Notist. HTTP/2 server push gives us the ability to proactively send assets to a browser without waiting for them to be requested. Sounds great, right?! However, is this new mechanism really the silver bullet we all thought it was? Is it time to abandon our build systems and stop bundling our assets entirely? Or are lack of server support and browser inconsistencies holding us back? Lastly, what are new specifications such as cache digests and the 103 status code doing to improve the situation? Using new research and real-world examples, this talk will take a deep dive into HTTP/2 server push, exploring the current and future best practices for loading assets in the browser. Giving us the knowledge to make better decisions when loading our web pages and ultimately leading to faster, more resilient user experiences. Amazing talk from @patrickhamann on modern web performance using HTTP2 server push and preloading at #FullStackFest. Thanks for the talk Patrick! I finally understand http2!